Zip Front hoodie sweatshirt with pockets, Brick Red, 80% cotton, 20% polyester. Made in USA. We've had several reports of moose on Poplar lake, seen glimpses ourselves, but now a guest has captured a couple of photos...thank you to Denise Kauth! Memorial day weekend, 2018. It feels like SUMMER is here! Start at Poplar, go through Lizz to Caribou, Horseshoe, Vista, and return. Super walleye and northern fishing. Beautiful country and short portages. Three to four days average. Easy. Start at Poplar, go to Skipper, Rush, Banadad, and return. Great walleye and northern pike fishing. Very scenic and remote. Two days average. Moderately difficult. One of our guests took this amazing shot of a rainbow over Rockwood Lodge (click here to see it large). Thank you Kevin! https://youtu.be/TIiPAtDxxOs Nice video of a family of 4 paddling across Ram Lake in the BWCAW, on the Eastern side of the wilderness near Grand Marais, MN. Today marks 90 years of operation for Rockwood Lodge and Outfitters! Originally Camp Rockwood, the land was purchased on July 16, 1926. We've had several sightings of moose twins at Rockwood, and now we have photographic evidence - thanks to our Guests! We are getting the new graphics printed and painted and on t-shirts. Check out some pictures! A nice snowfall at Rockwood Lodge on March 16, 2016. Webcam is up and running! The Rockwood Webcam is up and running! 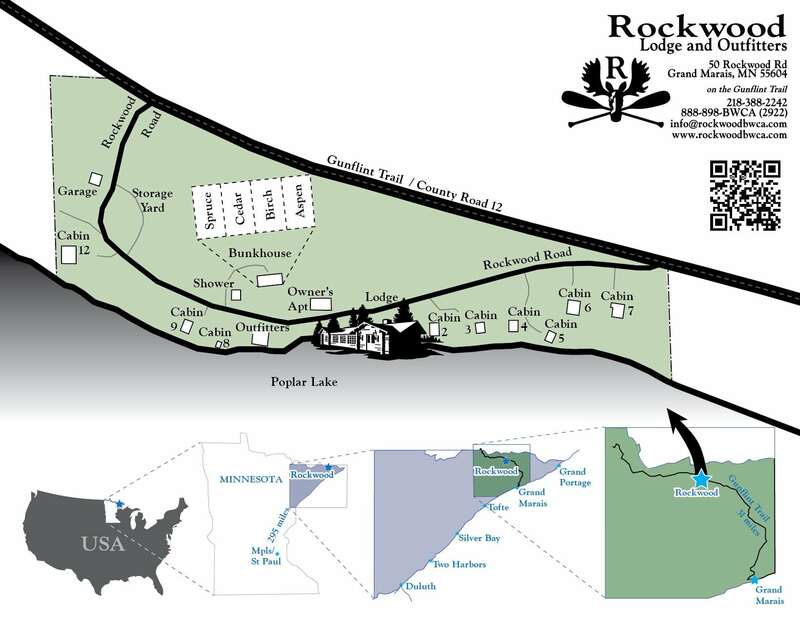 Bookmark this page: www.rockwoodbwca.com/webcam and visit it often as the image is updated every 15 minutes. Gunflint Trail a day after a nice snowfall. It's hard to describe how beautiful this drive is. North of Grand Marais, Minnesota on County 12. Lots of snow coming down 10:30am on Wednesday December 16, 2015 at Rockwood Lodge. Poplar lake is mostly ice covered but the edge has a couple of inches of water, and when the ice moves up and down it seems like the lake is breathing. loon-2-Carol-Sebek-Kelley Carol gave us some of her favorite photos from 2014! The snow is really thick and is hanging on the trees. Several guest images have been posted, please check them out! Beautiful snowfall last night, less than an inch of fluffy white. Behind Cabin 7 is a small stand of Poplar. 14 degrees and sunny on the last Sunday in November. The ice is brand new on Poplar, and there is still some open water.